"Not the best, but still a well thought out French course." With such a wide range of German learning programs, it can be difficult to decide to which is the right one for you. In this review I will be looking at one of the newest and most popular entrants to the German language market, Fluenz German. Fluenz German differs from many other courses, in that it places less emphasis on immersion learning and more on structured lessons and constant drilling. As a user of Fluenz German, you are guided through each of the exercises by Nora Naatz, your personal video tutor. This more structured approach has proven popular with many customers of the product. Here you will learn the main features of Fluenz German that you need to know about before buying. I will also cover those aspects of Fluenz German that I believe make it stand out from the competition. I will also discuss some of the limitations that Fluenz German has and how it could be improved. 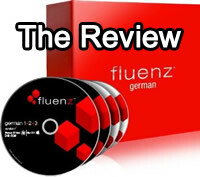 Finally I will give you my overall recommendation for Fluenz German. Fluenz German DVD Software - This is the main Fluenz German Course. There is a DVD for each of the levels of the course. There are a total of 150 sessions on the five DVDs, with each lesson up to 2 and a half hours long. Fluenz German Audio CDs - The course also includes 5 Audio CDs which you can listen to in your car or on your home stereo. This can also be copied and listened to on your MP3 or iPod player. Fluenz Navigator - This is a pocket sized reference book that you can take with you on your travels. It includes the key German phrases you will need when travelling through out Germany. Fluenz German 1+2+3+4+5 costs $398. That includes all five levels of Fluenz German and free shipping anywhere in the United States. Fluenz German also comes with a 30 day money back guarantee. During this period you can return Fluenz German for a full refund for any reason. There are other options to buy a single level or a group of levels, with prices to match. Excellent on Fundamentals - One of the most common complaints about both the Rosetta Stone and Berlitz German courses is an over reliance on immersion learning. Immersion learning can be effective, but only when you are being exposed all of the time to the language. With a software program that is not really possible. Fluenz German uses a much more teacher orientated approach. At the start of each lesson Nora Naatz explains the important points about the vocabulary and grammar that you are going to learn. By making sure that you understand the fundamentals the German language, it is much easier to make consistent improvements. High production values - Another area that Fluenz German stands out is in design. Some language courses look like software from the 1990's, but everything about Fluenz German looks modern. This includes the quality of the video and the user interface. Plenty of material - If you buy the complete Fluenz German course, you will have no shortage of study material. In total there are 150 different lessons, with many over two hours long. If you spend between half an hour to 1 hour a day studying, you should expect to take about six weeks to finish a single disk. The lessons are a lot of fun however, and so while there is a lot to get through it doesn't really feel like hard work. Constant repetition - Words and phrases are constantly repeated through out German Fluenz. When a new word is first introduced it will be clearly explained by your video tutor. It will then be repeatedly drilled in the lesson. You will also find it reappearing in future lessons as well. This constant repetition makes it possible for even the most stubbornly resistant learner to remember new words. Price - What will turn most people off Fluenz German is the price. At $398 it is very expensive. While this is approximately the same as other full German language courses, such as Rosetta Stone which is $374, it is still a lot of money. There are less expensive alternatives to Fluenz German, and so it is worthwhile investigating these if you are unable to afford the Fluenz course. Overly precise - On some activities Fluenz German seems to be too specific about which answers it will accept and which it won't. For example if you have used a period rather than a comma, it will not allow you to proceed. This is a small issue but it can be annoying having to work out precisely what is wanted. Script errors - As you watch through Fluenz German it becomes obvious that the video tutor Nora Naatz, is reading from script rather than ad libbing. This is perfectly acceptable as she is German and not a native English speaker. However occasionally there are mistakes made, that have not been caught and edited out. While this is not a big issue, it is something that Fluenz might want to improve in the future. No adaptive test - Unless you are a complete beginner to German it is difficult to know which level to start with. A nice addition would be to include an adaptive test, which would tell you which disk is best for you to start on. As it is, you have to use trial and error to decide which level your abilities are best suited for. Fluenz German is one of the best selling German language courses, and with its high production values and well thought out, structured approach to teaching, it is not difficult to see why. The main downside to Fluenz German is the price. It is not a cheap course and so it will not be for everyone. That said overall Fluenz German is a very good course, which can take a complete beginner through to a high level of conversational ability. Recommended for anyone who is serious about their German studies and can afford the high price tag. Last but not least, I do recommend comparing it with other German courses before you buy it.